My nephew who is handicapped and in a wheelchair, talked his mother and two aunts into taking him ghost hunting. We started with tours, then graduated to overnight lock downs (Mansfield State Prison, West VA Prison just to name a few) and have been perfecting our techniques with various equipment. So being all residents or former residents of Northern Michigan we decided to conduct a hunt at Pere Cheney. We had planned to conduct the hunt at night, but thought it wiser to try and find the place during the day, since it is remote and hard to find. So the three sisters set off and of course took our equipment with us. We had just purchased the new Ghost Box Ovilus III (incredible piece of equipment). After many wrong turns and a stroke of luck we found the place. We got out of the car and turned on the equipment and immediately started getting words, which after some question and answer sessions got some very interesting replies. Including several names of Murphy, Pat and several others. 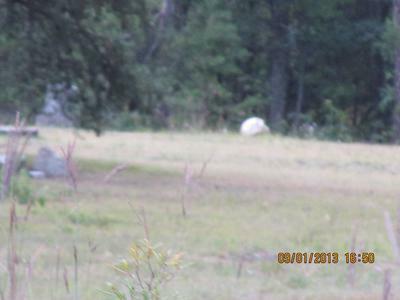 We were warned that the "rabbits" that had been left on the gravesites were evil and told about paranormal accidents that happened in the area. The area during the day was somewhat peaceful and as we explored the gravesites and were saddened by how many children were there. It was tragic to see the amount of destruction that vandals had done to the gravesites. About an hour or so into the hunt "Murphy" warned us to run, to leave, that the demons where there, that is place was evil. We asked why and who? We never really got a response but after the third warning we left. As we were leaving I just started taking pictures and this is what we got. Everyone has seen something different in it. What do you see? At about 11 pm we arrived back there with our nephew and proceeded to get all the equipment out, the ghost box, the EVP recorder, the scatter lights, headlamps etc. It was very creepy especially given that fact that the location is isolated and there is only one way in and out. It is just a two track barely large enough for one car. In fact, we never really got very far from the car we were spooked and we have been on some very scary overnight lockdowns. My sister was working the scatter light and saw areas where the "lights" were completely absorbed and black holes. We tried to take pictures but they did not show up well on the camera. The strangest part was when my other sister armed with the camera and I armed with the ghost box stepped out of the car and tried to take steps on the actual cemetery property we felt like a layer was there that we could not cross. We felt this every time we tried to walk on cemetery land. So stayed close to the car and communicated again with "Murphy". There was just a feeling of heaviness, too much silence, and just overall feeling of being watched. It was a very short experience (probably about an hour) since "Murphy" keep saying to run, evil and to leave. Needless to say, we left. We conducted our cleansing ceremony and away we went. We believe in respectful hunting and usually do tobacco offerings before we begin where we set the rules and always, always do a cleansing ceremony when we are completely off any property that we are hunting on. This was an interesting experience, I would certainly go back and hunt the area, but I think we will do it at dusk next time.